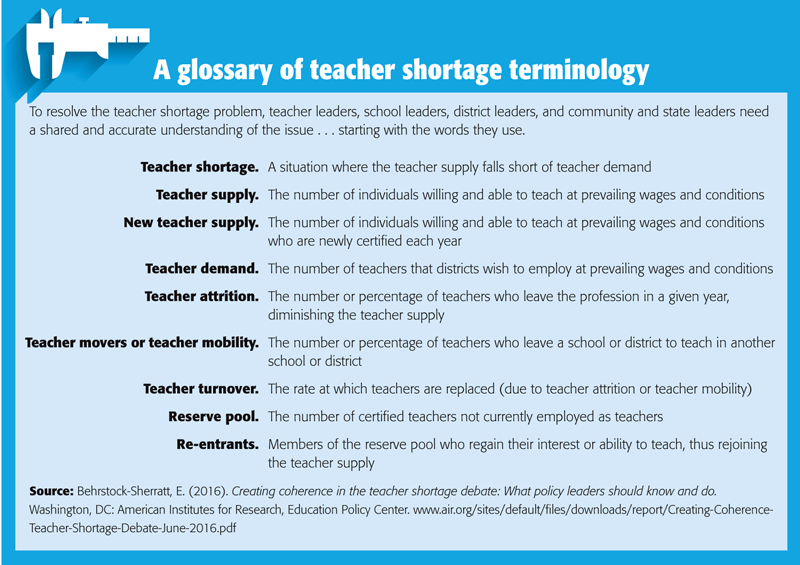 Years ago, many states came up with effective ways to address teacher shortages only to see those efforts dismantled for political reasons. It is time to restore them. Over the next decade, we will recruit and hire more than 2 million teachers for America’s schools. More than half the teachers who will be teaching 10 years from now will be hired during the next decade. If we can focus our energies on preparing this generation of teachers with the kinds of knowledge and skills they need to succeed in helping students reach these goals and on creating schools that use their talents well, we will have made an enormous contribution to America’s future. Over two decades ago, in its landmark report What Matters Most, the National Commission on Teaching & America’s Future issued a clarion call to policymakers to invest in strengthening the teaching profession, both to combat teachers’ high rates of attrition and to build their capacity to help all students meet the higher academic standards needed for the 21st century. Until the states improve teacher preparation and working conditions, argued NCTAF, their public school systems will continue to experience shortages of caring, competent, and qualified teachers (NCTAF, 1996). Nor will states be able to fill the gap by rushing new recruits into the classroom, the report added: In the absence of meaningful training and support, teachers tend to exit the profession as quickly as they enter it, as though coming and going through a “revolving door” (Marinell et al., 2013). In the wake of the NCTAF report, many states took bold steps to increase both the size and quality of the teaching workforce. Beginning in the late 1990s, policymakers funded a wide variety of efforts to improve teacher recruitment, preservice training, mentoring and induction, and ongoing professional development, including opportunities and incentives for teachers to seek national board certification (Darling-Hammond & Wei, 2009). Within a few years, researchers began to find that these policies were working, helping to strengthen the teacher pipeline and keep teachers in the profession (Guha et al., 2006). And yet, state policymakers gradually withdrew their support for these efforts, allowing them to wither on the vine. Two decades later, the nation faces many of the same challenges identified in What Matters Most. Current teacher shortages vary somewhat more by region and subject area, but they are just as serious today as in the 1990s. 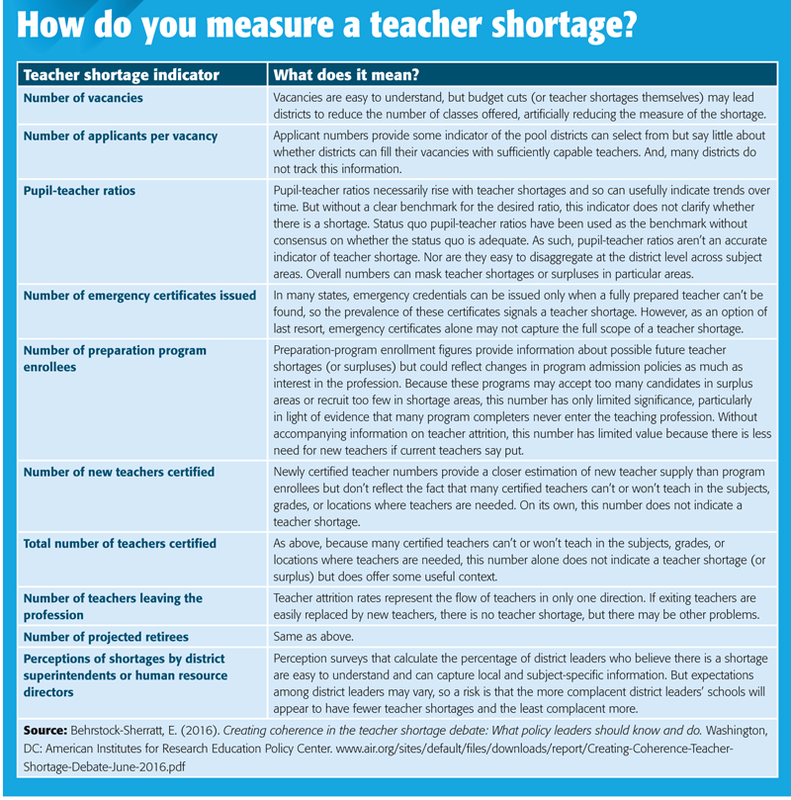 In the 2015-16 school year, for example, 48 states and the District of Columbia reported shortages of teachers in special education, 42 reported shortages of math teachers, 40 reported shortages of science teachers, and 30 reported shortages of bilingual education/ESL teachers (U.S. Department of Education, Office of Postsecondary Education, 2015). Student enrollment is on an upward trend — and expected to grow by 3 million in the next decade. Many districts and schools are trying to restore teacher positions and course offerings cut during the Great Recession. Fewer individuals are entering the profession: Between 2009 and 2014, enrollments in teacher preparation programs dropped 35% nationwide (from 691,000 in 2009 to 451,000 just five years later). The U.S. loses about 8% of its teachers annually; the attrition rate in this country is about two times as high as it is in top-performing nations like Finland and Singapore (Sutcher, Darling-Hammond, & Carver-Thomas, 2016). The declining interest in teaching likely has much to do with subtle shifts in the nature of the profession. As top-down school reform increased under No Child Left Behind, teaching became less attractive to young people. For example, a 2014 Gallup poll showed that teachers scored “dead last” among 12 occupational groups in agreeing with the statement that their opinions count at work (Kamenetz, 2014). One poll in Georgia found that teachers who leave the profession tend to report feeling “devalued” by recent policies and “under constant stress,” fueled by high-stakes testing and unfair and inaccurate teaching evaluations (Downey, 2016). Similarly, teachers have experienced a steep decline in professional autonomy, particularly in high-poverty schools. In response to a 2003 survey by the U.S. Department of Education, a majority of teachers said they enjoyed a high degree of professional autonomy. By 2012, however, the reverse was true, with the majority reporting they had little autonomy (U.S. Department of Education, 2015) — and as research by the sociologist Richard Ingersoll has made crystal clear, teachers who experience lower levels of decision-making authority in their classes and schools are significantly less likely to stay in teaching as a career (Ingersoll, 2001). In some ways, then, the teaching profession has fallen back to where it was in 1996, when the NCTAF report was released. In other ways, though, the challenges that teachers now face are much more difficult than before, and for students the stakes are much higher. To become prepared for college and careers, students need to develop advanced analytical and communication skills so they can navigate and excel in a dynamic, information-rich environment (Autor, Levy, & Murnane, 2003). Yet, most teachers continue to work in schools that were designed for an industrial era, when few graduates attended college or pursued a professional career. Further, teachers of low-income students, English learners, and students of color are especially likely to work in these outdated, factory-model schools, and they are most likely to be forced to adopt a narrow, one-size-fits-all curriculum, further constraining their autonomy and professionalism (Ravitch, 2010). 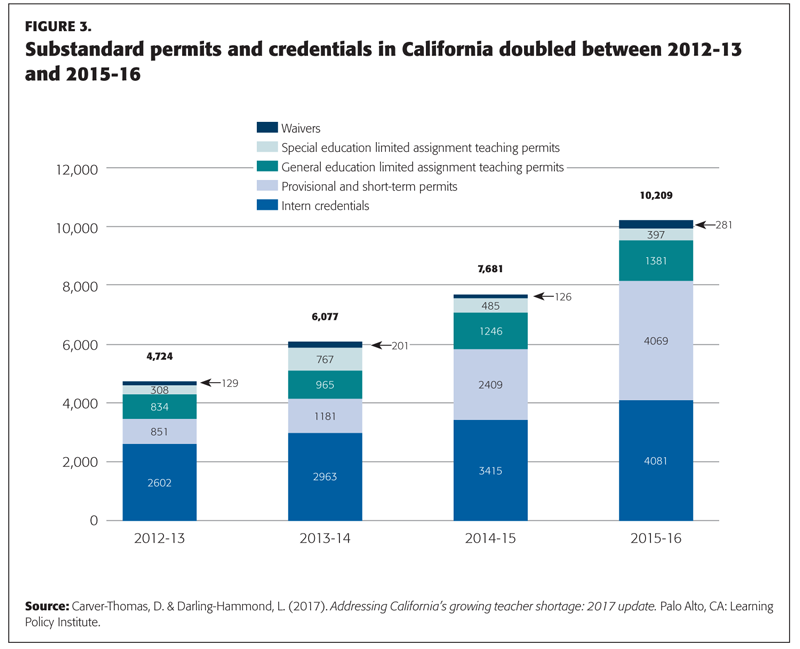 To help readers understand how and why the teaching profession has come to this point, we take a closer look at two states, California and North Carolina, that launched significant efforts, beginning in the late 1990s, to strengthen the profession and build coherent systems of teacher development. While these states differ in size, population, and many other ways, their policy strategies had much in common: Both states raised minimum salaries for teachers, reformed their teacher education systems, and offered scholarships and forgivable loans as ways to recruit teachers to work in hard-to-staff fields and locations. Both states created mentoring systems for new teachers and incentives and supports for veteran teachers to pursue certification by the National Board for Professional Teaching Standards. Both states invested in statewide efforts to improve teacher recruitment, and both explored innovative ways to get the most effective teachers to work with the neediest students. Finally, both states gradually dismantled these policies, programs, and services in response to economic and political pressures. Today, both are confronted, once again, by looming teacher shortages, especially in high-need schools. In 1996-97, when the NCTAF report was released, California embarked on an ambitious effort to reduce class sizes, and, since smaller class sizes translate to more classes overall, this meant the state had to hire tens of thousands of additional teachers. However, the supply of qualified teachers fell far short of demand. 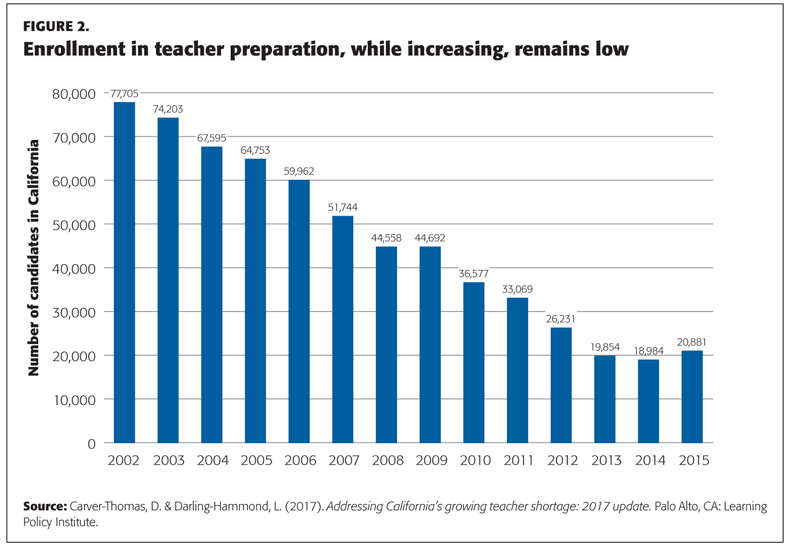 By 2000, 14.5% — or 42,000 — of California’s classrooms were headed by a teacher who had not completed, or in some cases even begun, a preparation program (and English learners and low-income students were most likely to be assigned these underprepared teachers). Among new hires, nearly half lacked a preliminary credential (Shields et al., 2003). In response to this crisis, the state introduced a number of new programs, including a statewide teacher recruitment system, fellowships and loan forgiveness for teachers working in high-need areas, and tax credits and block grants for local districts to recruit and retain effective teachers. Drawing largely upon NCTAF recommendations, the state also launched a comprehensive data collection system to track teacher staffing patterns and needs, and it began to offer $20,000 stipends to teachers who earned national board certification and chose to work in low-performing schools. Thus, when the economy began to improve and when ballot measures brought new revenue to school districts, California found itself in a desperate position: Once again, the schools were looking to hire tens of thousands of teachers, but the challenge of finding good candidates had become more difficult than ever. Not only were there few candidates in the preservice pipeline, but the state no longer had functioning systems for recruiting, supporting, and retaining effective teachers. Further, most of that increase was represented by emergency-style permits, issued in response to “acute staffing needs” and given to individuals who met neither subject-matter standards nor basic standards for teaching competency. Altogether, substandard authorizations totaled more than 10,000 in 2015-16 (comprising nearly half of all credentials issued in the state), a level not seen since the late 1990s. In short, California now faces a massive teacher shortage, but the infrastructure that it built to address such a shortage no longer exists. In 2016, the state began to reinvest in that infrastructure, launching a new statewide recruitment center, expanding undergraduate teacher credentialing programs, and restoring a pathway for paraprofessionals to enter the teaching profession. But each of these efforts will take years to affect the supply of teachers. Like California, North Carolina has gone through a lengthy process of building a strong teacher development system only to dismantle it for political and economic reasons. 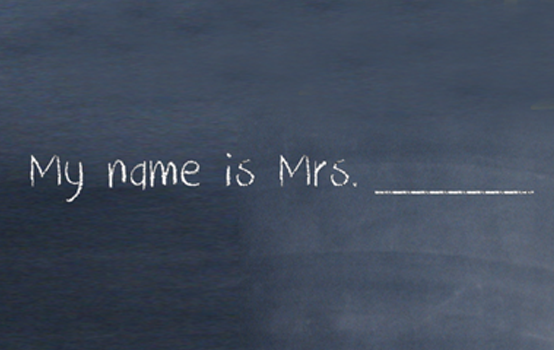 And like California, the state now faces a teacher shortage. The North Carolina story begins with its former governor, James B. Hunt, who served for two eight-year periods, from 1977-85 and from 1992-2000. As the founding chair of NCTAF, Hunt knew well that if his state (where teacher salaries ranked 47th in the country) hoped to build a world-class education system, it would have to make serious investments in teacher recruitment, preparation, and professional learning opportunities. Under Hunt’s leadership, that is precisely what happened. For example, in the mid-1980s, North Carolina created the Teaching Fellows Program, an effort to attract bright young college students into teaching, give them rigorous preparation, and keep them in the profession — at one point, the initiative even funded scholarships for 11,000 new recruits to enroll in revamped teacher education sequences at a number of the state’s universities. Over time, the program proved to be quite successful. As one administrator noted, “By and large, the Teaching Fellows have had a large impact on teaching and learning in this state. These are dedicated and well-prepared new teachers who contribute a great deal. They become leaders in their schools almost immediately” (Berry, Price, & Noblit, 2002). Around the same time, the state created the North Carolina Center for the Advancement of Teaching (NCCAT), which provided innovative support to veteran teachers: week-long residential programs, which allowed participants to engage in scholarly activities, reflect on teaching, and renew enthusiasm for their work. By the mid-1990s, NCCAT had served 4,000 teachers, and state officials credited it with boosting participants’ creativity in their classrooms and schools. In the late 1990s, Hunt worked closely with the legislature to pass the Excellent Schools Act, which made North Carolina the first of NCTAF’s partner states to pursue its comprehensive recommendations. By the 2001-02 school year, the state’s teacher salary ranking had rocketed to 19th in the U.S., just $2,000 below the then-national average of $44,655. North Carolina also created strong incentives for teachers to earn national board certification, which involved a rigorous process by which teachers had to document the effect of their instruction on student learning. The state offered to pay the $2,500 assessment fee, fund three additional professional development days to support the process, and provide a 12% salary increase to teachers who became board certified. To further encourage professional learning, North Carolina also began awarding a 10% pay increase to teachers who earned master’s degrees related to their subject areas. Then, in 2002, the state launched a biannual survey of its 90,000+ teachers to collect data on their job satisfaction and working conditions. A few years later, the legislature funded a Teacher Cadet Program (modeled after a well-regarded program in South Carolina), a college-credit bearing course for high school seniors interested in the teaching profession. These efforts seemed to have a salubrious effect, including a rise in graduation rates and meteoric rise in student scores on the National Assessment of Educational Progress. 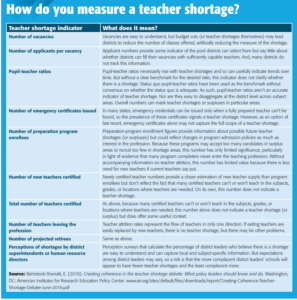 Granted, teacher shortages continued to beset policymakers, in part due to the lack of attention to out-of-field teaching and new teacher induction. But during the Hunt years, “Teachers felt like they were respected” (Coble, 2017). By the late 2000s, however, Hunt had left office, and his approach to teacher development began to fade. While one in five of the state’s teachers had become a National Board Certified Teacher (NBCT), policymakers no longer showed much interest in cultivating their leadership potential or encouraging them to teach in the neediest schools (Koppich, Humphrey, & Hough, 2007). Investments in maintaining teachers’ salaries also began to wane, exacerbated by the recession of 2008. In 2010, Republicans who opposed Hunt’s agenda dominated the legislature and wasted no time in stripping away teachers’ due process rights, reducing their health care benefits, and rolling back their salaries. By 2013-14, North Carolina once again ranked 47th in teacher pay, with average salaries having fallen more than 17% (adjusted for inflation) from a decade earlier (N.C. Department of Public Instruction, 2016). In addition, the legislature cut NCCAT’s funding in half, eliminated the Teacher Cadet program and salary bonuses for master’s degrees, and reduced support for teachers seeking board certification (rescinding the offer to pay their assessment fee). Perhaps most striking, the legislature abolished the Teaching Fellows Program and sent its entire funding allocation to Teach For America, which tends to lose more than 80% of its recruits by their fourth year of teaching (Clotfelter, Ladd, & Vigdor, 2007; Boyd, et al., 2006). These legislative changes have left many North Carolina teachers to conclude that the state’s policy leadership “just doesn’t care that much about (them)” (WJAL, 2016). The results have been predictable. As the profession became less attractive, veteran teachers began leaving the classroom, while young college graduates became increasingly likely to choose other career paths. The state education agency recently reported that 15% of the state’s teachers left the classroom in 2014-15 — a precipitous rise since 2010 (N.C. Department of Public Instruction, 2015). From 2010 to 2014, enrollment in North Carolina’s teacher education programs fell by 26% (and by 30% for graduate programs), and, as in California, its school districts became increasingly reliant on short-cut entry programs to fill classroom vacancies (Bastian, 2015). As of 2013-14, only 36% of the state’s teachers were prepared by in-state university programs — ironically, though, recent research findings show that new teachers prepared at the 15 campuses of the University of North Carolina system are far more likely than those hired from out-of-state programs to be effective instructors and to remain in the classroom for more than five years (Bastian & Wing, 2015). Similarly, the Teaching Fellows Program was scrapped in spite of evidence that its graduates had much higher retention rates after three and five years (90% and 75%) than did other teachers prepared through both traditional university and alternative routes in the state (80% and 68%) (Podolsky & Kini, 2016). Noting the legislature’s lack of interest in such findings, some political observers have suggested that the real reason for the program’s elimination was that it was supported by Democrats with “close ties” to former Gov. Hunt and his focus on professionalizing teaching (Fitzsimon, 2015). Valuing teacher leadership (Sutcher, Darling-Hammond, & Carver-Thomas, 2016). As the experiences in these two states illustrate, though, the challenge is not to design and implement programs to strengthen the teaching profession — the real challenge is to sustain such supports over time. This is not a technical problem so much as a political one. Thus, we conclude by pointing out that creating a stronger and more attractive teaching profession will depend on effective advocacy. In particular, we argue that an important source of political strength lies in the many teacher networks that exist across the country. Over the past several decades, countless school districts, universities, professional associations, nonprofits, and other organizations have created valuable opportunities for teachers to discuss their work, share practices, and learn from each other (Little, 2003). For example, many states boast large numbers of NBCTs. North Carolina alone has more than 20,000, many of whom participate in dozens of teacher networks that are active around the state. These include over 500 NBCTs who are part of a collaborative managed by the Center for Teaching Quality (CTQ), thousands of alumni of NCCAT and Teaching Fellows, and a cohort of over 450 classroom experts identified a few years ago by the Department of Public Instruction to develop instructional and professional development resources. Similarly, CTQ has identified 15 California-based networks of teachers (Kohl & Kerchner, 2016), including the California Professional Teaching Development Centers, Stanford’s National Board Resource Center (NBRC), and the Instructional Leadership Corps sponsored by NBRC and the California Teachers Association, which has enabled nearly 300 teacher leaders to leverage professional learning for 40,000 other teachers (Heins, Snyder, & Adams, 2016). We do not know the precise numbers of teachers who participate in such networks across the country. But we do know that nearly six in 10 teachers nationwide regularly use technology to reach out to and interact with teaching colleagues (Scholastic & Bill & Melinda Gates Foundation, 2014), and one in five teachers report participating in online networks (Grunwald Associates & Digital Promise, 2015). It is safe to say, then, that many tens of thousands — perhaps hundreds of thousands — of teachers are actively engaged in these sorts of professional exchanges. Recent studies have pointed to “the value of strong social networks among teachers for the spread of reform implementation and innovative climate . . . and their capacity to change” (Moolenaar & Sleegers, 2010). If networks are well-facilitated, they can connect teachers and encourage collaboration. Networks also reduce teacher isolation while elevating teachers’ capacity to serve in any number of formal and informal leadership roles, which can greatly reduce attrition from the classroom. But networks can do more, empowering teachers, heretofore isolated from each other, to find and use their collective voices as advocates for effective policies and practices. Indeed, recent opinion polls suggest that if teachers were to take more prominent roles in advocating for their profession, large portions of the American public would be inclined to support them. Nationwide, according to the PDK Poll of the Public’s Attitudes Toward the Public Schools, two in three public school parents say they have “trust and confidence” in teachers (2013). In California, one recent poll found that 60% of the state’s voters would give public school teachers a letter grade of A or B for their teaching, and 77% believe the state should “spend more on schools” (Tulchin Research & Moore Information, 2016). In North Carolina, 62% of poll respondents said the best way to improve the state’s schools would be to increase funding for public education, particularly to increase teacher salaries (Z. Smith Reynolds Foundation, 2016). In short, the time is now for teachers to speak out. With help from parents and the many other Americans who trust and support them, they can and should become more forceful advocates — in their local districts, statehouses, and national forums alike — for the kinds of teacher recruitment, preparation, and support that are known to strengthen the profession and yield powerful results for students. Autor, D.H., Levy, F., & Murnane, R. (2003). The skill content of recent technological change: An empirical exploration. Quarterly Journal of Economics, 118 (4), 1279. Bastian, K.C. (2015). Rebuilding an infrastructure to advance teaching in North Carolina. Raleigh, NC: Think NC First. Berry, B., Price, P.G., & Noblit, G. (2002). The effects of long-term investment in the improvement of teaching: North Carolina 1980-2000. Seattle, WA: University of Washington, Center for Teaching Policy. Boyd, D., Grossman, P., Lankford, H., Loeb, S., & Wyckoff, J. (2006). How changes in entry requirements alter the teacher workforce and affect student achievement. Education Finance and Policy, 1 (2), 176-216. Coble, C. (2017). Personal communication. April 3. Darling-Hammond, L. & Wei, R.C. (2009). Teacher preparation and teacher learning: A changing policy landscape. In Gary Sykes (Ed. ), Handbook of education policy research (pp. 613-636). Washington DC: American Educational Research Association. Grunwald Associates LLC & Digital Promise. (2015). Making professional learning count: Recognizing educators’ skills with micro-credentials. Washington, DC: Digital Promise. Guha, R., Campbell, A., Humphrey, D., Shields, P., Tiffany-Morales, J., & Wechsler, M. (2006). 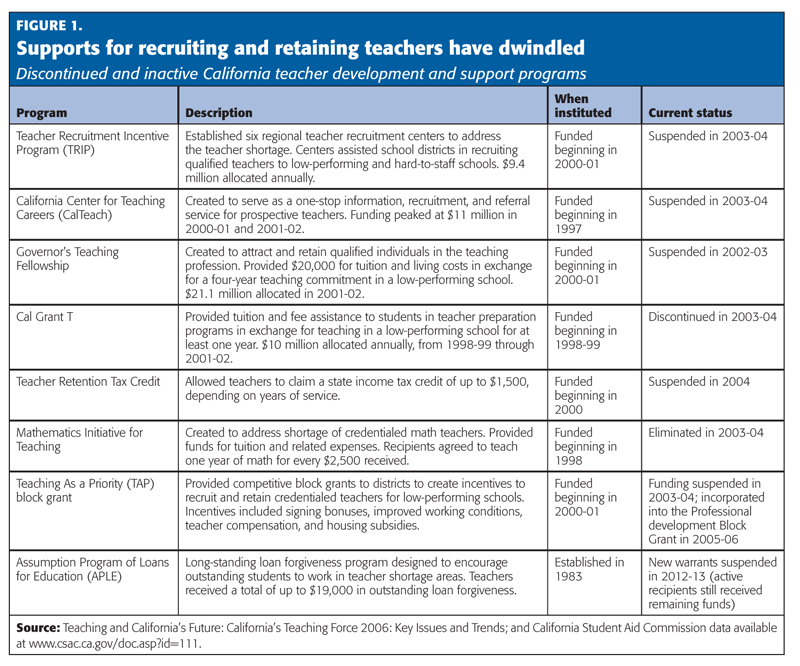 California’s teaching force 2006: Key issues and trends. Santa Cruz, CA: The Center for the Future of Teaching and Learning. Ingersoll, R. (2001). 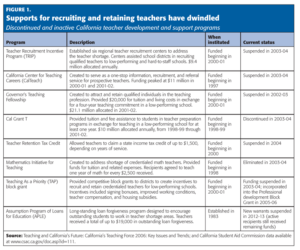 Teacher turnover and teacher shortages: An organizational analysis. American Educational Research Journal, 38 (3), 499-534. Kamenetz, A. (2014, April 9). Almost 70% of teachers are not engaged. Here’s why that matters so much. Washington Monthly. Kohl, K. & Kerchner, C. (2016, December 16). Teacher networks: Here, there, and everywhere. Education Week. Little, J.W. (2003). Constructions of teacher leadership in three periods of policy and reform activism. School Leadership & Management, 23 (4), 415-416. Marinell, W.H., Coca, V.M., Arum, R., Goldstein, J., Kemple, J., Pallas, A., Bristol, T., Buckley, C., Scallon, A., & Tanner, B. (2013). Who stays and who leaves? Findings from a three-part study of teacher turnover in NYC middle schools. New York, NY: Research Alliance for New York Schools. Moolenaar, N.M. & Sleegers, P. (2010). Social networks, trust, and innovation: The role of relationships in supporting an innovative climate in Dutch schools. In A. Daly (Ed. ), Social network theory and educational change. Cambridge, MA: Harvard Education Press. Podolsky, A. & Kini, T. (2016). How effective are loan forgiveness and service scholarships for recruiting teachers? Palo Alto, CA: Learning Policy Institute. Shields, P.M., Esch, C.E., Humphrey, D.C., Wechsler, M.E., Chang-Ross, C.M., Gallagher, H.A., Guha, R., Tiffany-Morales, J.D., & Woodworth, K.R. (2003). The status of the teaching profession 2003. Santa Cruz, CA: The Center for the Future of Teaching and Learning. Sutcher, L., Darling-Hammond, L., & Carver-Thomas, D. (2016). Coming crisis in teaching? 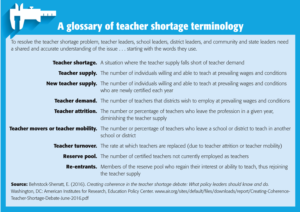 Teacher supply, demand, and shortages in the U.S. Palo Alto, CA: Learning Policy Institute. U.S. Department of Education Office of Postsecondary Education. (2015). Teacher shortage areas nationwide listings 1990-1991 through 2015-16. Washington, DC: Author. Originally published in May 2017 Phi Delta Kappan 98 (8), 8-18. © 2017 Phi Delta Kappa International. All rights reserved. PATRICK M. SHIELDS (pshields1015@gmail.com) is executive director of the Learning Policy Institute, Palo Alto, Calif.
One issue here in California that I don’t recall being mentioned in the article is the high cost of housing. Many new teachers simply cannot afford to live in many sections of California, especially the Bay Area, due to astronomical housing costs. This is a major factor in recruiting and retaining teachers in California. There are a few school districts (San Francisco and San Jose) that either are or are planning to, provide subsidized housing for new teachers. Of course, if teachers were paid a salary related to the cost of housing in the area, perhaps there would be less of a shortage of qualified teachers in these areas.